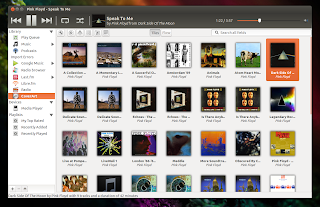 CoverArt Browser is a Rhythmbox plugin that lets you browse and play your music library using an album art view. track view can be toggled automatically on click as well as configured to manually open. The Rhythmbox python3 support is not available in the PPA packages to to use this plugin with Rhythmbox 3.0, you must install the plugin manually! After the installation, launch Rhythmbox and enable CoverArt Browser from the Rhythmbox Plugins dialog. For other Linux distributions, see the installation instructions available on the CoverArt Browser GitHub page.